More people every year choose to stand while working or studying. And why wouldn’t they when the benefits are so numerous? Researchers from Stanford have discovered that those who alternate between sitting and standing are 78 percent more likely to report a pain-free day than those who use regular workstations. The Oxford Journal of Public Health published a study in 2015 that shows how effectively can sit-to-stand desks reduce sedentary behavior of children. Since 2013, the American Medical Association has been recognizing potential risks of prolonged sitting and encouraging employers, employees, and others to adopt alternative solutions, such as standing desks. The health benefits of standing while working or studying have been extensively researched. They range from general benefits that apply to virtually anyone to specific benefits that you may or may not notice after you switch from sitting to standing. While the exact number of extra calories burned by standing versus sitting ranges from study to study, we know with certainty that standing is the way to work if you want to lose weight. Of course, a healthy diet is still the most important piece of the weight loss puzzle, but if you can burn extra calories while working on your PC just by standing instead of sitting, your chances of tipping the scales your way increase noticeably. Spending a long time in one position, going through the same movement patterns is a recipe for chronic pain. Those who spend hours and hours sitting in front of the computer know how suddenly neck, shoulder, and back pain can appear and how insufferable it can be. If not addressed, the pain caused by sitting in front of the computer often continues for the rest of the day, lowering one’s quality of sleep and making life a nightmare. Frequent alternating between sitting and standing directly addresses the root causes of computer-related chronic pain. Long hours of sitting are linked with various cancers (such as the color and the breast cancer) and cardiovascular diseases. It takes a very expensive ergonomic chair for the supply of blood to the lower half of the body to be preserved. Since no ergonomic office chair fits everyone equally well, it makes sense for employers to instead purchase standing desks to provide employees with the same health benefits for a lot less money. If you’ve been sitting for long hours in front of the computer almost every day for the past twenty years, you can’t expect your body to instantly get used to standing all day. Expect the transition to be a gradual process and give your body enough time to acquire the necessary fine motor skills. Initially, you may find it more difficult to focus on your work, and you may even find standing to be more uncomfortable than sitting. This is perfectly normal and should be expected. Consider using a timer to measure how much time you spend standing. Start with ten minutes every hour and increase this time gradually until you can stand comfortably for an hour. Even after you get fully used to standing, it’s not advisable to completely avoid sitting. Remember that the goal is to avoid spending a long time in one position. To maximize the health benefits of your standing desk, periodically alternate between sitting and standing. There’s no shortage of excellent standing desks. 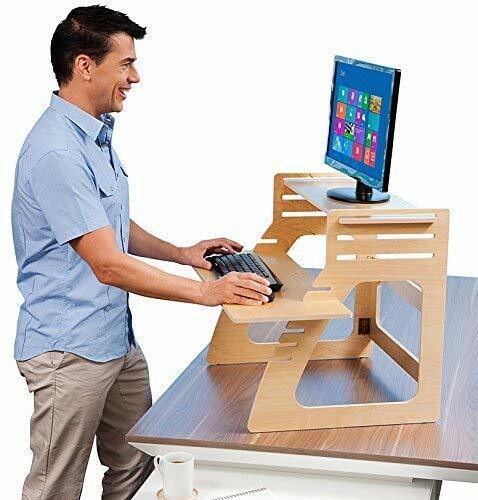 Some can replace your existing PC desk, while other are meant to turn it into a standing desk. If you’re either not ready or can’t swap your existing desk for a sit-to-stand desk, the Varidesk is the right solution for you. 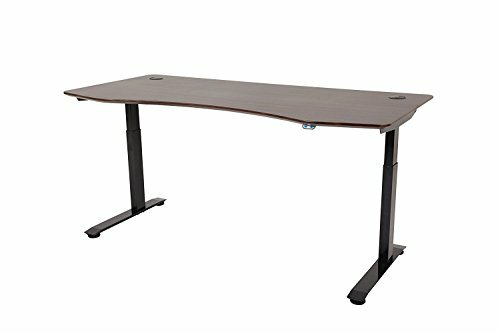 This height-adjustable add-on desk is designed to turn any traditional desk into a sit-to-stand desk without any assembly or modification. 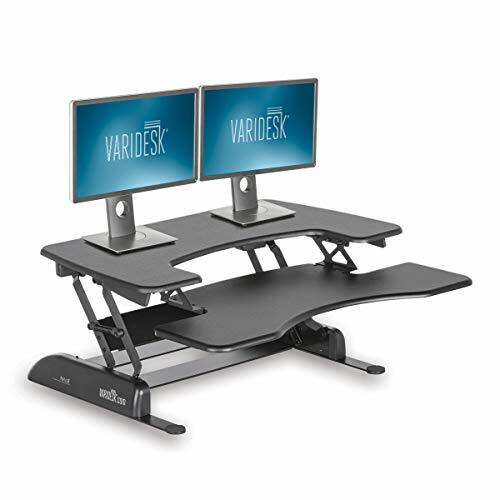 Varidesk can lift up to 35 pounds in just 3 seconds, and it offers 11 different positions for ergonomic comfort. 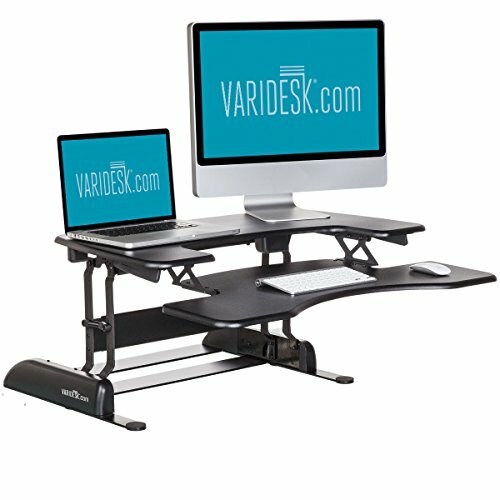 It doesn’t matter whether you’re 5’3″ or 6’1″ tall because Varidesk is for people of all heights. The Pro Plus 36 version has two independent decks. The top deck can accommodate two large monitors or a single monitor and a laptop, while the bottom deck provides plenty of space for a full-size keyboard and a mouse. Both decks have ergonomic cutouts and are covered with a premium material that doesn’t stain and feels great against the skin. 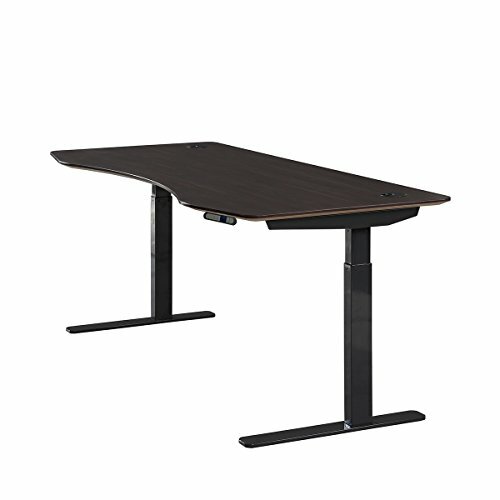 ApexDesk Elite is a large standing desk adjustable from 29 inches to 48 inches. You can get it with an American walnut, black, light oak, red apple, red cherry, or white MDF top board. By itself, the top weighs over 60 pounds and measures 71 x 33 inches. The board is further reinforced with a one-piece fixed steel beam under it for maximum stability. The height adjustment is motorized and controlled by two buttons. Each leg has its own motor, and the two motors can together lift up to 235 pounds. Even with a triple-monitor setup and lots of other stuff on the desk, the motors don’t struggle at all. The desk can be assembled without any tools in under 30 minutes, but you can also order it with a professional assembly. Mount-It! is an innovative sit-to-stand solution that features an optional dual-monitor mount and a spacious keyboard tray. Mount-It! can go from 5.25 inches to 19.75 inches in seconds with a press of the side handles. The entire desk can hold up to 33 pounds and requires no assembly. With the dual-monitor mount, the entire top deck, which measures 35 x 25 inches, remains unoccupied. This gives you more than enough room for your laptop, a telephone, documents, and office supplies. The bottom deck is large enough for a full-size keyboard and a mouse. Mount-It! is also available without the monitor stand, and it even comes in a wall-mounted version for non-traditional workplaces and people with very limited office space. The Winston workstation can convert any standard office desk into a sit-to-stand desk in minutes. 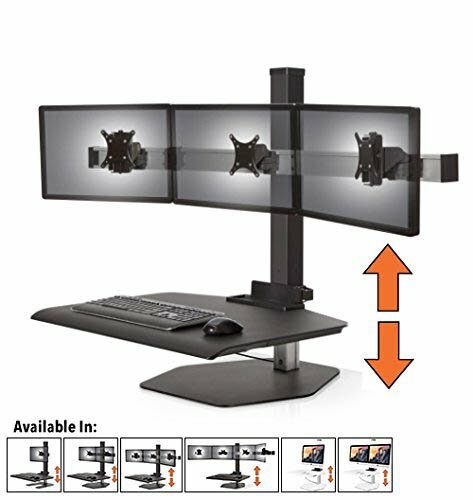 It comes with a triple-monitor mount and a large work surface. With its minimalist design and rugged construction, the Winston workstation has been designed to fit into a variety of office spaces. Once you mount your monitors and guide the cables through the handy cable-management holes on the back, you can lift them up to 18 inches to find the most comfortable standing position no matter how tall you are. The integrated surface for a keyboard and mouse features a handy storage tray to help you keep everything organized and within reach. 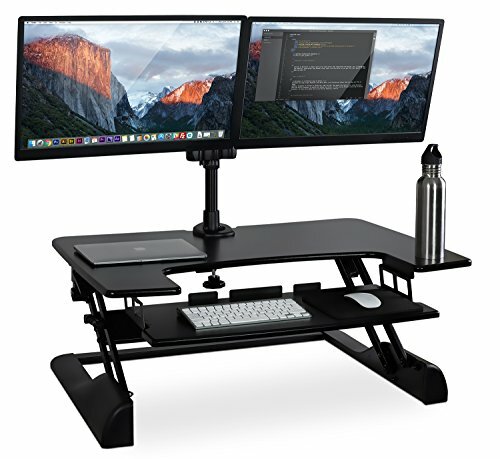 The Winston workstation can support up to 36 pounds, and it’s manufactured and assembled in the United States. Well Desk is a simple, eco-friendly sit-to-stand solution made from wood in the United States. Even though there’s not a single metal beam to be found, it still can support up to 35 pounds of weight thanks to its ingenious design. It comes disassembled in a box, but it takes just a few minutes to assemble it. Once assembled, Well Desk measures 24 x 20 x 22 inches. It can be adjusted to accommodate users from 5’3″ to 6’1″ tall. The top deck can fit an up to 27-inch monitor, and the bottom keyboard tray is 30 inches long—plenty for a full-size keyboard and a mouse. All surfaces have been coated with an ultraviolet-cured epoxy acrylate finish to protect them against water damage, and all wood materials are CARB Phase 2 compliant, which means they emit virtually no carcinogens such as formaldehyde.